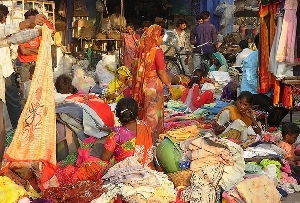 Rana Sanga Market, located in Chittorgarh is popular among many tourists because of the large number of items that are sold here. Shopping is an integral part of traveling to any place around the world. Rajasthan, which is considered to be one of the most popular tourist destinations of the world, comes with ample of shopping opportunities. The different parts of Rajasthan are dotted with numerous shopping areas which are flocked by tourists throughout the year. Chittorgarh, also known as the 'Fort City of India', boasts of a number of shopping areas. The bazaars of Chittorgarh are known for displaying items that form an important part of the culture of the state of Rajasthan. Rajasthan, which has a long and rich history, was the land of the Rajputs. Synonymous with battles, conquests and many more, Rajasthan holds a significant part in reflecting the tradition and culture of India. The architectural beauty of the state is worth noticing, the numerous forts, palaces, havelis and the like attracts tourists all round the year. In addition, the natural beauty, the blend of the old and the new in the different parts of Rajasthan has made it one of the most visited places in the whole world. Other than the forts, Chittorgarh is famous for its shopping areas. Rana Sanga Market, which is known for selling exquisite Rajasthani items, is a major shopping area of the city. A huge variety of products are available in the shops of Rana Sanga Market. The different items and products found at Rana Sanga Market are hardly found in other parts of India. Whether it is metal wares, fabrics, wooden toys, handicrafts, jewelry, everything is found in Rama Sanga Market Chittorgarh. The metal wares are bought by many tourists as souvenirs or memento. The beautiful fabric works are made attractive with vegetable dyes and are sold like hot cakes in the market. The wooden toys which come from Bassi Village are one of the best buys from the Rana Sanga Market. The wooden toys are made more attractive when they are painted with colors. The colorful 'jutis' which are made from camel leather are also displayed in the Rana Sanga Market. Shopping in Rana Sanga Market essentially involves buying of these colorful shoes. These shoes come decorated with intricate designs and embroidery. The handicrafts that are sold in abundance in this market of Chittorgarh reflect the craftsmanship of the people of Rajasthan. Ideal for reflecting the culture and tradition of the desert state of Rajasthan, the numerous handicraft items are valued by the tourists visiting this market. Many tourists visit this market only to buy the various works of Thewa jewelry. However, while visiting this shopping area of Chittorgarh, tourist must master themselves in the art of bargaining. Tourists visit Rana Sanga Market in order to have a glimpse of the liveliness and vibrancy of the bazaar.